Follow the yellow brick road for this fun, family-friendly 5K! Our friends at Terraloco are hosting Family Promise Rochester for a $5 5K fundraiser to support our work stabilizing homeless families in Rochester. The walk/run begins at 6 p.m. on Monday, May 8 outside of Terraloco at 1190 16th St SW, Rochester, MN. The No Place Like Home 5K is a teaser for our upcoming No Place Like Home Gala on Thursday, June 15. 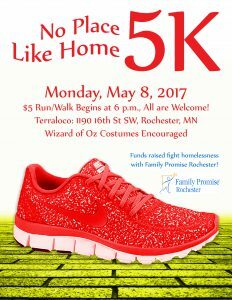 Runners and walkers are encouraged to wear Wizard of Oz costumes for the 5K. This event is proudly sponsored by Tonic.